Have you been looking for a fast and simple solution to upload and attach files to records and easily organize them in your NetSuite File Cabinet? Whether you’d like to attach and save customer agreements to a customer master record or scanned vendor bills to a vendor bill transaction record, we recommend using the NetSuite File Drag and Drop bundle. Here are the steps for you to install and configure the NetSuite File Drag and Drop bundle solution. Enter a File Cabinet folder name in the ‘Global Destination Folder’ if you want all attached files to go to one folder for all record types. Enter an email address in the ‘Error Message Recipient’ box for someone, other than Administrators, to receive error messages related to the bundle. In the ‘Folder Name’ box, set a Folder Name to specify where uploaded files are saved for this record type. Alternatively, you can also set a folder pattern to point to the destination folder. subsidiaryId – Saves files to a folder with the ID of the current user’s subsidiary. departmentId – Saves files to a folder with the ID of the current user’s department. roleId – Saves files to a folder with the ID of the current user’s role. recordId – Saves files to a folder with the ID of the record where the file is attached. Click ‘Save’ or ‘Save and Next’ if you want to configure additional record types. When you are done setting up all record types, click ‘Save and Next’ to move to the Summary. Finally, click the ‘Finish’ button. 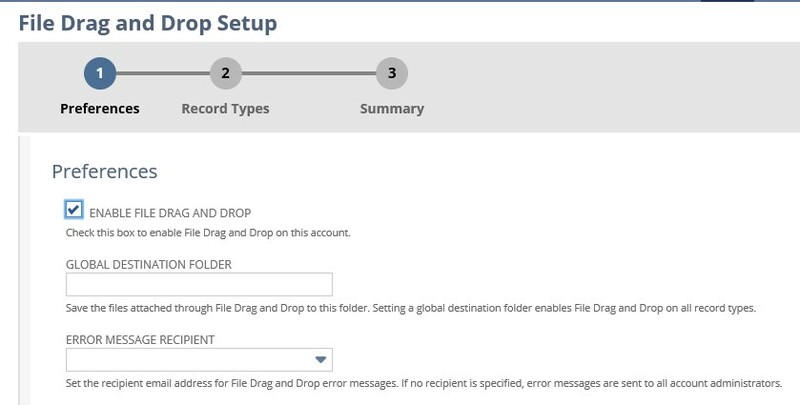 When you drag and drop a file onto the record, the file will automatically be saved into the NetSuite File Cabinet based on the Folder preferences, and you will also see the file located under the Communications sub-tab on the record. If you would like support with NetSuite’s File Drag and Drop solution – or you’d like to know how to further customize your NetSuite environment to meet your business needs, contact our NetSuite consultants today.